Mayoral candidate Gary Gaspard formally kicks off his campaign at Curts Cafe, 2922 Central St., on Jan. 22. Gaspard wants to unite the city and increase affordable housing. As an immigrant to the United States, Gary Gaspard said he had to work especially hard to improve his life and seek out opportunities for advancement in the country. After settling in Evanston in the 1980s, he drove a taxi to earn a living. But Gaspard soon realized he wanted a college education and went on to earn both undergraduate and graduate degrees. 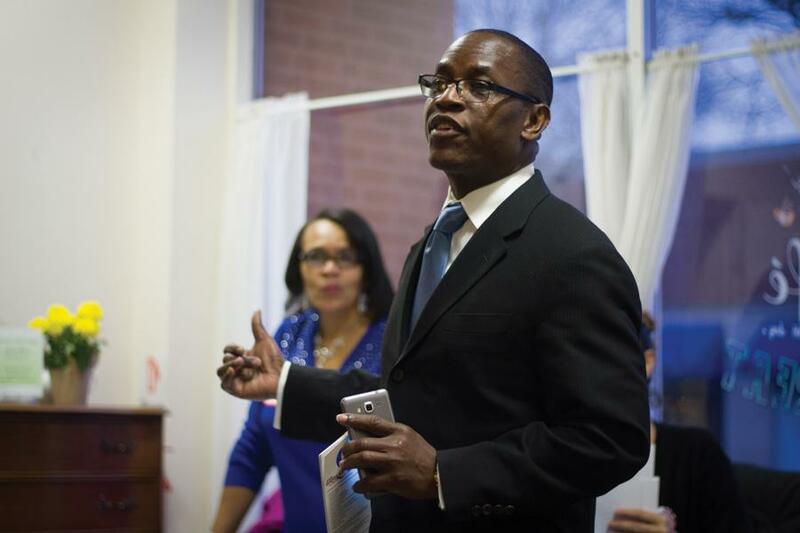 Now, the 53-year-old is hoping to take on a new challenge as mayor of Evanston. Gaspard, currently a faculty adviser and instructor in the social work program at Northeastern Illinois University, said he wants Evanston to become a more close-knit city. His life has been dedicated to mentoring young people, and he said he would draw on this experience as mayor. Gaspard said he was born and raised in Port-au-Prince, Haiti, by his single mother in a low-income family. He lived with his mom and five siblings, as well as with his aunt and her five children. In 1982, Gaspard, then 19, traveled to Chicago on a temporary visa to visit family. He soon settled in Evanston and stayed there after his visa expired. Gaspard, who is fluent in Haitian Creole and French, received his green card in 1990. Gaspard started out in Evanston driving a taxi. After acquiring his green card, he began to become more involved in the Haitian community in Evanston and Chicago, producing and hosting various radio programs. Having not received a high school diploma before coming to the U.S., Gaspard said he realized he wanted to go back to school and earn a college degree. After receiving his GED, Gaspard enrolled in Northeastern Illinois University. He graduated from NEIU in 2005 with a degree in criminal justice and a minor in social work. Gaspard then earned his master’s degree in social work and social service administration from the University of Chicago in 2008. While at NEIU, he served as the president of the student government association for two terms. There, he said he developed his passion for working as an advocate for underprivileged people. Elias Lekkas met Gaspard while the two served in student government at NEIU. Lekkas said no one campaigned the way Gaspard did for the association and that those campaign skills are still apparent today. After receiving his master’s degree, Gaspard worked as a treatment counselor from 2010 to 2013 for Youth Outreach Services, a non-profit organization that works with at-risk youth on Chicago’s West Side, also counselling Chicago Public School students. He has served in his current role at NEIU since 2014. Elizabeth Moreno, a junior at NEIU who took several courses taught by Gaspard, said he created a “sense of community” outside class. In April 2013, Gaspard was elected as Evanston Township supervisor but resigned in October of that year, citing the time commitment as an issue. In his first few weeks as supervisor, the township’s drafted budget came in 29 percent over budget, despite Gaspard’s plan to draft a budget with a 30 percent reduction in spending. “Everyone was mad at me, and I didn’t know what was going on,” he said. The township was dissolved soon after Gaspard resigned. Gaspard said he is focused on upholding Mayor Elizabeth Tisdahl’s legacy of promoting diversity in the city and working for youth. He wants to expand the mayor’s summer youth employment program to run yearlong and is also focused on promoting affordable housing. Gaspard said he would focus on helping establish trust between police officers and citizens, especially those in the black community. He said his experience working with at-risk youth has prepared him to take on this challenge. “I would like a police officer to see a black man not as a threat to society but with a humanistic perspective, that this young guy has a mom, has family, has a wife waiting for him,” Gaspard said. He said he wants to form a citizens advisory committee and a mayoral advisory committee made up of past mayors who are still living. Phenix Jeanty, who attended elementary school with Gaspard in Haiti, said Gaspard’s background makes him unique. Gaspard said he has big goals and knows the mayoral race will not be easy, but he said he overcame challenges throughout his life and hopes to do so again.